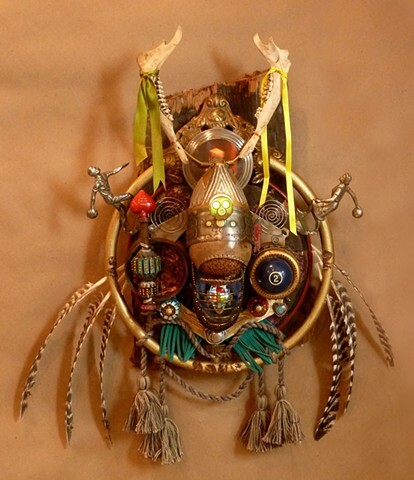 One of my everything-but-the-kitchen-sink improvisations, This piece is combination of a coat-of-arms and shamanistic talisman. Bowling trophies, wild turkey feathers, jaw bones (from The Texas Bone Lady), tassels, leather fringe and ribbons decorate the perimeter. The central element is a souvenir, unwearable wooden shoe stuffed with a softball with a peeling flap. Quite anthropomorphic! I put small LEDs in the "helmet" to lend mystical connotations.